The Pesky Pole : Carlos Cortes Back in Columbia? Carlos Cortes Back in Columbia? The Columbia Fireflies have yet to finalize their roster but there is speculation that former Gamecock, Carlos Cortes, could start the season in the town where his college career ended. 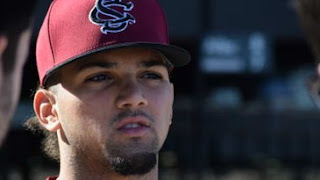 2019 will be the first full pro season for Cortes who was drafted last June by the Mets in the third round. Cortes appeared in 47 games last year with the Brooklyn Cyclones, the Short Season Single A affiliate of the Mets. Cortes slugged .264/.338/.382 in those games with 4 homers and 24 runs batted in. Cortes is listed as the Mets 19th best prospect and is viewed as a defensive liability with no real position. He only played second base last season in Brooklyn and in 165 chances he made 7 errors. Cortes knows he will have to hit in order to get to the majors The Mets are committed to developing him at second base but scouts have speculated that his body frame and lack of range and quickness would make him an ideal catcher. The Mets have yet to work him out at catcher. Cortes went 1-2 with the Mets in Spring Training. 2019: The Year of Rafael Devers? Could This Be The Year of Christian Walker?